All sold! If you want more please email me. 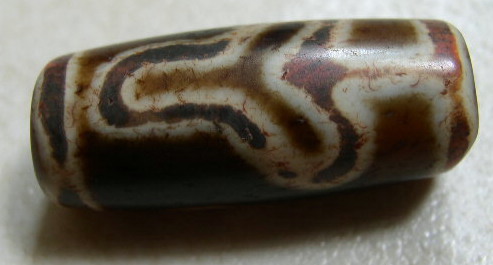 All Dzi beads here are about 1 inch long and half an inch round. Old and over 80 years old! Best price ever US$48 each! New pumtek beads from Burma in bracelette and stringed choker necklace. If you not prepared to pay for expensive old beads you can't wear. We have these new beads and similar to old designs and beauty at a wearable price. Known to Chinese also as "Heavenly Beads", dzi beads has a unique design formed around the theme of how many "eyes"; from 1 "eye" to 15 "eyes". Special from Tibet/mountains, are the famous dzi beads which are made from nature creation over years of formation. Closely similar to Jade, it is known for its hardness as well as beauty. Some aqcquire it for its energy, these beads are known to Chinese to bring good fortune. Those show at the top are the real old and expensive ones. Those here are the new reproductions and cheaper ones. Since 1904 when a Chinese cloisonné vessel won first prize at the Chicago World Fair, cloisonné has appealled greatly to foreign tastes. Developed during the Yuan dynasty (1279-1368) and perfected during the Ming dynasty (1368-1644), cloisonné objects were originally made for use by members of the Imperial Palace. The cloisonné process consists of casting bronze into various shapes to which copper wire is affixed in decorative patterns. Enamels of various colours are then applied to fill in the "cloisons" or hollows, after which the piece is fired three times. Finally, the piece is ground and polished to achieve a delicate luster and smooth surface. Today, cloisonné are manufactured in a variety of shapes and colors, ranging from such practical objects as vases, bowls, ashtrays and pens to such decorative objects as bracelets and animal figurines. The beauty of Cloissonne and Crystals beads in a more practical function; decorating your expensive handphones. Comes in glittering colors and gorgeous designs. The most fashionable thing on your handphone. US$2.00 each. Comes in brown, blue, purple, black and green colors. Various designs of beads and hangings. Contact me for quantity orders.